Posted: Tuesday 23rd April 2013 in News, Owned and earned media, Retail Strategy, Thought Leadership. Summit’s SEO team have worked alongside long-standing client, Carpetright, to create a St. George’s Day orientated infographic to celebrate the national day of England’s patron saint. As a company born out of Canning Town in East London, Carpetright are established as one of Britain’s most recognisable retailers. Summit identified the infographic entitled ‘Carpeting England’ as an original and creative way to commemorate St George’s Day while subsequently encouraging awareness of the Carpetright brand. Creative content marketing is a central feature of Summit’s SEO proposition representing a natural and sustainable means of promotion. 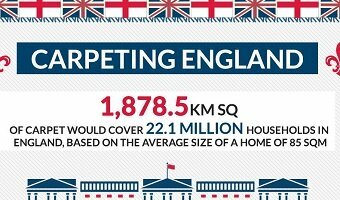 In this latest publication we look to answer the question ‘How much carpet would it take to cover every home in England?’. Together with Carpetright Summit have compiled the facts and figures which amongst other mind boggling statistics have revealed that 939,249,960 sheep would be required to provide the wool and over 1,800,000 million tyres would be recycled to create enough underlay to laid across the 22.1 million homes in England.